PYEONGCHANG, South Korea, Feb. 2 (Yonhap) -- South Korean Nordic combined skier Park Je-un said Thursday he will compete with a pioneer mindset, as he is set to face top-class athletes in an upcoming international competition. Park will take part in the International Ski Federation (FIS) Nordic Combined World Cup in PyeongChang, Gangwon Province, some 180 kilometers east of Seoul, this weekend. The first FIS Nordic Combined World Cup in South Korea is also one of the test events for the 2018 PyeongChang Winter Olympics. Park is currently the only Nordic combined skier for South Korea. The Nordic combined national team was first formed in 2013 with Park and Kim Bong-joo, but only the 23-year-old is still competing. "I feel lonely, but I also have big pride that I'm the only one representing the country in this sport," Park told Yonhap News Agency after finishing his practice session at Alpensia Cross-Country Skiing Centre in PyeongChang. Nordic combined is a winter sport that mixes cross-country skiing and ski jumping. Park got his start in cross-country, but then focused on ski jumping and went on to represent South Korea in that sport. But in 2013, he switched to Nordic combined. "I'm a guy who likes to do my own things or chase something that others don't go for," he said. "Since no one was competing in this sport, I thought it suited my character." Park, however, sometimes laments that he doesn't have teammates. He especially feels lonely after training. "When you look at other teams, the skiers chat and laugh with their teammates, which I cannot do," he said. "After training, I try to read books and try to talk to friends on the phone to forget about the loneliness." His closest friend is probably his father Park Ki-ho, who is the skier's head coach. The elder Park previously represented South Korea in cross-country skiing at the Winter Games. 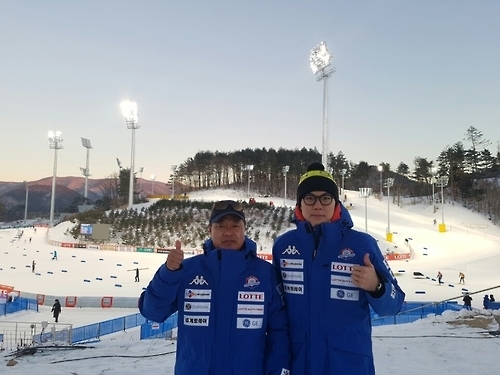 They are the first South Korean father-son duo to be on the same national team in a winter sport. The Parks admitted that considering their current level, it is difficult to have a podium finish in top-tier international events like the World Cup. However, they hope their efforts will inspire other young skiers in the nation. "I know Je-un is alone right now, but if he competes well, I'm sure the country will have many Nordic combined skiers," Park Ki-ho said. Park Je-un can theoretically compete at the PyeongChang Olympics thanks to the host's quota, but he wants to qualify for the Winter Games on his own. The skier said he will try to finish inside the top 30 at the upcoming World Cup. His best World Cup finish was 39th in Val di Fiemme, Italy, last year. "I've competed in fewer than five World Cups in my career, but I'm looking to finish inside the top 30," he said. "If I can maximize home ground advantage, I can probably get a good result. But you never know until the day of the competition." Park Ki-ho said his son might bring some surprise results at the 2022 Winter Games, if not the PyeongChang Olympics. "Other countries took 40 or 50 years to get close to an Olympic medal in Nordic combined, but we've only had our taste of this sport at the international level for about two years," Ki-ho said. "Nordic combined is a relatively new sport for South Koreans, so we have to invest more into it."